Below is the high-level process for reviewing invoice documents. 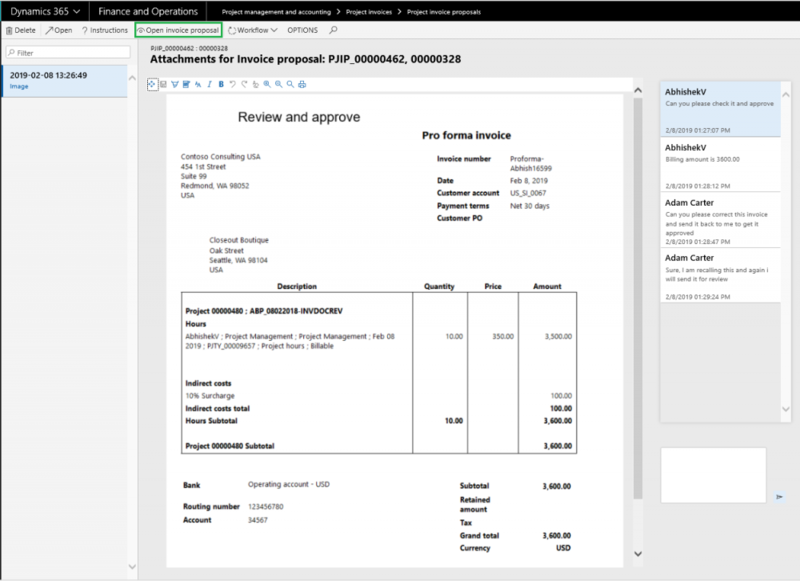 User will creates invoice proposal and when the document gets submitted to invoice proposal workflow, an invoice report will be added as attachment auto magically and Invoice document review button will enabled for editing as seen in the below visual. On clicking of Invoice document review button, new form opens with the invoice report attached. Here the approver can leave the notes, corrections or any edits. The workflow approvers can reject so a Project accountant can fix and resubmit the document. On the right hand side of the Invoice review document ‘Comments’ functionality is added for the users to put in their thoughts and if any clarifications required. Comments can be added on each attachment and history of it will be maintained. Note: Security roles has been enabled for ‘Invoice document review’ form same as Invoice proposal form. After this the project accountant can modify the invoice lines and resubmit the invoice proposal with new document attached to the proposal and hence maintaining the history of the invoice proposal. Added new button called “Invoice document review” at the list page of “Work items assign to me” form, So user can navigate to “Invoice document review” form from list page itself and take action accordingly. Added new button called “Open invoice proposal” in the invoice document review form, so user can navigate back to the invoice proposal from “Invoice document review”.